Home News & Analysis MENA When Diplomacy Loses: Are Israel and Iran On The Path to Escalation? When Diplomacy Loses: Are Israel and Iran On The Path to Escalation? Iran has been ratcheting up the rhetoric while Haaretz warns of the consequences of Iran’s ambitions in Syria. It all started back in February, when an Iranian drone and an Israeli F-16 were shot down at the Syria-Israel border. More incidents and additional quarrels over the Iran Nuclear Deal could lead to more grievous confrontations between the parties involved. On 10 February, the Israeli Air Force (IAF – Heyl Ha’Avir) intercepted and shot down an Iranian unmanned aerial vehicle (UAV) that was flying within its borders. 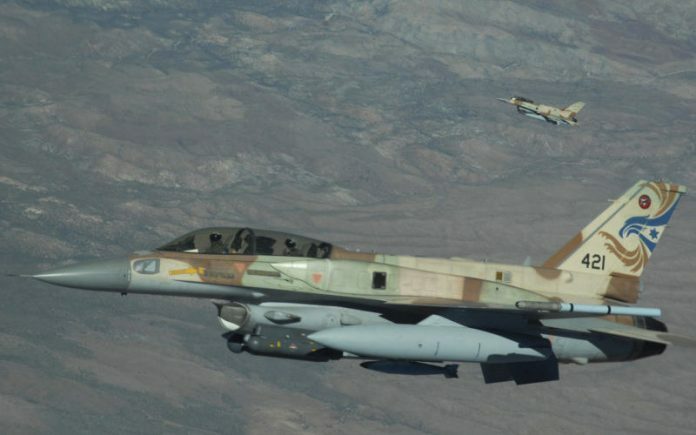 Soon after, the IAF dispatched its F-16I jetfighters in order to destroy the UAV control vehicle in Syrian territory. However, as the F-16Is engaged their targets, an intense barrage of anti-aircraft fire welcomed them. One F-16I was eventually shot down, while the two pilots managed to eject and landed on Israeli territory. In retaliation, Israel conducted surgical strikes against at least twelve Iranian targets within Syria. The events of 10 February represented a number of unprecedented developments. First, this was the first time that an Iranian drone penetrated Israeli airspace. Previously, Iran’s proxies – such as e.g. Hezbollah – usually carried out these tasks. This marks an upgrade in Tehran’s presence and involvement in operations against Israel. Also, the retaliation unleashed by the downing of the F-16 represented the first Israeli strike against manned Iranian bases. Hence, similarly to the Iranian counterpart, Israeli forces are not steering clear of a direct confrontation with their regional competitor. Moreover, the IAF losing an aircraft is news in itself. Indeed, Israel had not lost a single jetfighter in a combat operation since the time of the Lebanon War at the beginning of the ‘80s. It is not clear what anti-aircraft weapon system brought the jetfighter down. IAF F-16Is are equipped with electronic countermeasures that give them an advantage against many anti-aircraft systems. There are, however, sophisticated systems in Syria – such as the Russian-made Buk-M1-2 or S-400 – that could successfully engage advanced jetfighters like the IAF F-16Is. The loss of the jetfighter is noteworthy in another regard as well, as it could change Israel’s course of action. Indeed, Israel has been ceaselessly conducting airstrike in Syria throughout the Civil War, targeting Hezbollah’s supply chain as well as Syrian and Iranian strategic military facilities and bases. This line of conduct might be subject to change in light of these recent events; as an Iranian official commented, “the era of hit and run is over” and his words might ring partially or entirely true. Displaying a piece of the UAV downed over the skies of Israel, Prime Minister Benjamin Netanyahu warned Iran from the stage of the Munich Security Conference to not “test Israel’s resolve”. Netanyahu asserted that Israel would not let Tehran proceed with their plans against Tel Aviv, stating that his country is ready to wage war against Iran or its proxies to defend itself. While Iran rejected all accusations brought forth by Netanyahu, Israel’s Prime Minister might find additional reasons to reinforce his anti-Iranian foreign policies in recent domestic developments. The Israeli police recently claimed to have enough evidence to charge Netanyahu with corruption. Faced with this accusation, the Prime Minister might be strongly motivated to show resolve against Israel’s arch-enemy in order to deflect attention from himself – more so as if he can count on the Trump administration’s unconditional support and even on the assistance of countries equally worried about Iran’s rise, like Saudi Arabia. Also in Munich, Lebanon’s Defense Minister Yaacoub Sarraf reacted to Netanyahu’s words. Commenting on the Israeli Prime Minister’s promise to go after Iran’s proxies, Sarraf asserted that the government in Beirut is ready and willing to defend its territory against external aggression. Any Israeli operations taking place on Lebanese soil would, therefore, prompt an armed reaction against it. Sarraf’s pledge may well prove empty, as it is hard to imagine Beirut conducting military operations against Tel Aviv. Nevertheless, Israel will feel forced to gauge potential reactions from other neighbouring countries besides Syria. Meanwhile, there have been further revelations about Iran allegedly having up to 10 military bases in Syria, two of them near Israel’s border. The Nuclear Deal as the final straw? The year 2018 will see an increase in tension between Iran and Israel. This could potentially lead to a limited, regional conflict between Tel Aviv and Tehran’s proxies. Yet, while the anti-Iranian front tightens, a more direct confrontation might arise from the Nuclear Deal. Indeed, the dissatisfaction of Israel and the USA grows, since they believethe Deal is incapable of preventing Iran from getting nuclear capabilities. At the same time, Iran’s resentment towards the US is increasing. In particular, Iran accuses the Trump administration of meddling in its business with other countries in order to counter the positive effects that the lifting of the sanctions ensued. Under such circumstances, the Nuclear Deal does not pay off and Iran would benefit from withdrawing. In this regard, Tehran warned its competitors that the world “would face another nuclear crisis, which would be very difficult to be resolved”, if the Nuclear Deal was to be scrapped. If this is going to be the case, Iran will surely re-embark on its nuclear endeavour with renewed vigour. Simultaneously, Israel, the US, and the rest of the regional powers worried about Iran’s rise, might push for more aggressive solutions in order to deal with the prospects of a nuclear Iran once and for all. If diplomacy loses this round, the probability of a direct confrontation between these parties will increase dramatically. Previous articleDoes President Jokowi’s Attempt to Secure Infrastructure Projects Before Elections Hold Risks for Indonesia? Next articleAs Several Latin American Governments Lead Charge Against Fracking, Will Colombia Follow Suit?